Pro Tools SE is available in three new bundles. Avid has announced the Pro Tools SE Family: a new range of music production systems designed for newcomers to the world of computer recording. This range contains three products: KeyStudio features M-Audio's 49-note KeyStudio MIDI controller keyboard; Recording Studio comes with the M-Audio FastTrack audio interface; and Vocal Studio includes M-Audio's Producer USB microphone. · Mix up to 24 tracks (16 audio tracks, 8 virtual instrument tracks) and use the included pro-quality effects - reverb, EQ, and guitar amp/distortion effects - to create richly detailed and polished recordings. · Use more than 100 different virtual instruments and more than 3 GB of audio loops to quickly construct songs and ideas. · View integrated, intuitive tutorials that make it easy to learn how to compose, record, edit and mix on the Pro Tools SE platform. · Record two instruments at once, and take advantage of built-in composing features including MIDI sequencing and score editing, which provide professional-grade creative solutions to users of every ability level. 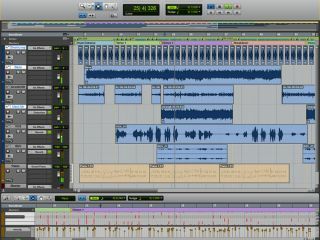 Looking at these, you'll see some limitations - only 24 tracks and a maximum of two recording simultaneously being the most obvious ones - but this is very much an entry-level version of Pro Tools, and you suspect that Avid is hoping that those who get a taste for it will eventually upgrade to the more capable Pro Tools M-Powered. US prices for the Pro Tools SE bundles are $99.99 for Avid Vocal Studio, $119.99 for Avid Recording Studio and $129.99 for Avid KeyStudio. They'll be available in the States this month - UK pricing and availability is still to be confirmed. Avid has also revealed that Pro Tools SE will now ship with M-Audio's MobilePre audio interface, while its MIDI controller keyboard line-up is being expanded with the launch of the Oxygen 88. This is an 88-note hammer action keyboard that also sports 32 assignable buttons, knobs and faders and support's M-Audio's DirectLink automatic mapping technology. The Oxygen 88 will be available in September and has a US price of $749.95.